PLEASE READ THE INSTALLATION INSTRUCTIONS BELOW! We are delighted to announce that our new apps for iOS and Android are here, and they are better than ever. As the world goes mobile, especially the Majority World, these apps enable us to spread the gospel further and faster than ever before. For you techies: we now have a single code base that cross-compiles to both platforms. For you non-techies, this means we can squash bugs all at once, and add new features that will show up on both platforms. 1. DELETE YOUR CURRENT APP. 2. 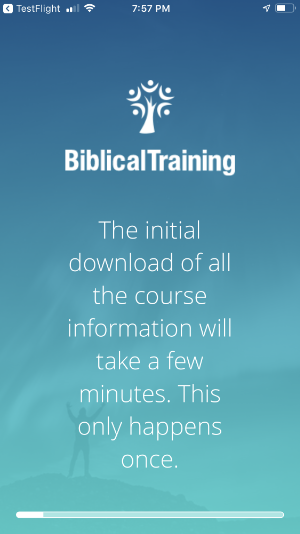 Go to App Store or Google Play store, search for "BiblicalTraining," and download the app. 3. You can visit our help page to see how to use the app. We are thankful for the generosity of our programmer who did the work for only $36,000. The starting point for apps this complicated is generally around $100,000. We paid for this out of our general budget; it would be great if you could help us recover our costs. Thank you again for your use and support of BiblicalTraining.org.